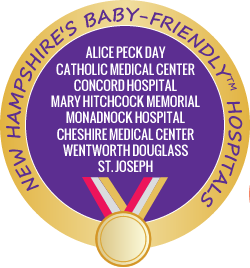 In NH 48% of all deliveries occur at Baby-FriendlyTM designated facilities. New Hampshire Breastfeeding Legislation House Bill 441 - This bill sets forth the right of a mother to breastfeed her child in public. Do you need help breastfeeding? Enter your zip code at zipmilk.org to find support near you. * Source: CDC National Immunization Survey (NIS) 2016-2017, among 2015 births. Breastfeeding rate indicators are the percentage of infants breastfeeding at the specified time points, calculated among all infants. The rate for infants receiving formula before 2 days of age is calculated among breastfed infants. 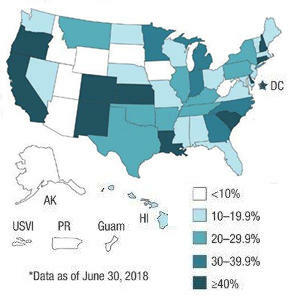 * MICH-21 and MICH-23 current rates represent babies born in 2015, National Immunization Survey 2016-2017; MICH-22 current rates represent employers providing an on-site lactation/mother's room, Society for Human Resource Management, 2018 survey; MICH-24 current rates represent babies born in Baby-Friendly Hospitals and Birth Centers designated as of June 2018, Baby-Friendly USA.